Projects — Heirloom Builders, Inc. Here's just a small sampling of the many treasures we've built over the years. This beautiful home is a masterpiece in function and design. It's core and shell feature a super insulated envelope with less than 2.0 ACH (air changes per hour). Solar Thermal rooftop collectors that heat the concrete slab floor and domestic hot water. And enough PV (solar) panels to power the entire home. The custom cabinets in the photo below were built from White Oak that we fell to clear the house site. White Oak cabinetry built from a couple trees on the house site. The Straw Bale home pictured above is Logan Parker's personal home, and the design headquarters for Heirloom Builders, Inc. The house itself generates all the electricity and hot water needs to support a family of four. And with a gravity-based rainwater collection and filtration system, the home also provides enough clean water for all domestic uses with virtually no maintenance cost. This home integrates self-reliance with luxury living. A straw bale home that generates all of its own power, hot water, clean air and filtered rainwater. This project was an amazing experience to build. The homeowners Blaise Freeman and Lydia Scheidler put many hours into thoughtful planning and hard labor to help us make their dream a financial reality. Featuring a super-insulated core and shell, earth and lime plasters, reclaimed cabinetry, locally sawn hardwoods, an earthen floor and enough solar to power the home, the Freeman-Scheidler residence is second to none. Building Science at its best. 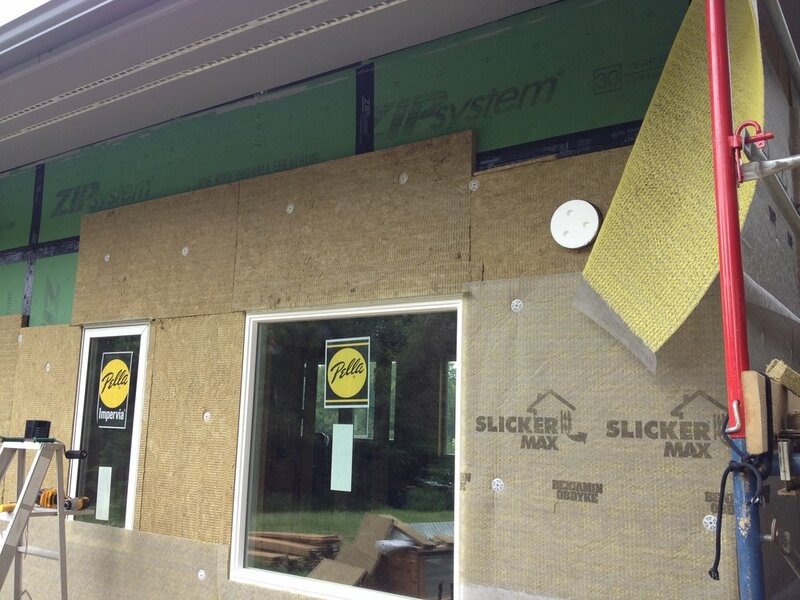 Zip sheathing, fire-proof Roxul exterior insulation, a rain screen, and lime render finish (not pictured). The house below was a great example of two homeowners bringing their skills together to really help make a project go right. The cottage-style aesthetics, the tight and efficient building systems, and overall flow of this layout make it the perfect family space. We all worked together as a team to design a layout for the Clore Family and create super tight, yet cost-effective system that will work for many generations to come. This house features a vaulted living room and kitchen, 3+ bedrooms and 3 full baths. All within 1900 sq ft. On a sealed crawlspace, with super insulated walls and ceilings, Energy Star windows and doors, and a smart water heater and humidity control. It is a model for smart and affordable building. New super-insulated and air tight home in Saxapahaw, NC. Another fantastic couple to work with in building a natural home on a budget. They came to the table with a good set of ideas and design criteria, yet were open to shifting things around to get it all right in the end. We got the general floor plan and flow they wanted, and an energy efficient straw bale shell with lime plaster/render and durable detailing that will make this home cool in the summer, warm in the winter, and off-the-grid all year 'round! Straw Bale Home designed for Annika Valikhovskaya and Joe Orenstein in Alton, VA.